Can't afford a couture gown for your wedding? That's fine! No one's judging! Buy a dress from Modcloth and call it a day. Because these knock-off gowns? Not good. Not good at all. 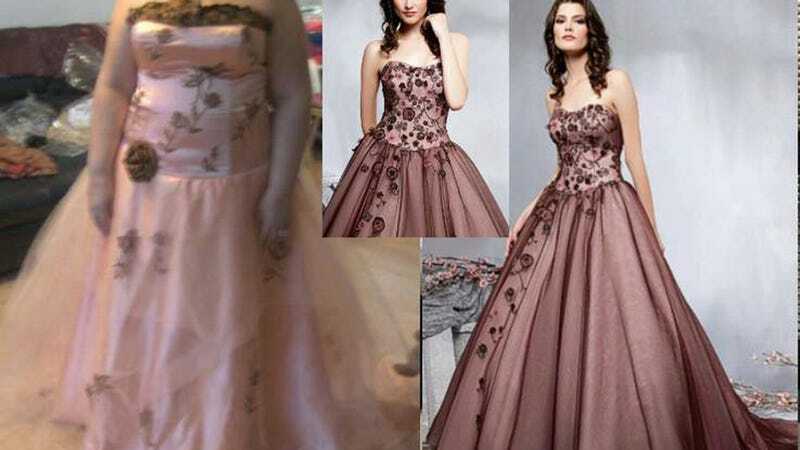 Posted by grief-stricken brides to the internet, these dresses, which promised to look like swanky high fashion gowns you see in magazines but actually resemble deflated birthday cakes and community theatre costumes as sewn by your arthritic mother, are a cautionary tale for what can happen when you try to skimp on your big day. No one's saying you have to go for an expensive wedding gown (The Metro estimates the cost of some couture dresses at over $40,000), but if you want to look like you spent a fuckton of money on your dress, don't buy a cheap knockoff. BE SAFE OUT THERE! SHOP LOCAL! I CARE ABOUT YOU!